Mangoes stricken with pale yellow wither before they blow up into full-sized fruits. Sun-struck, newspapers wilt in hands, before they are read. My city red with blisters. 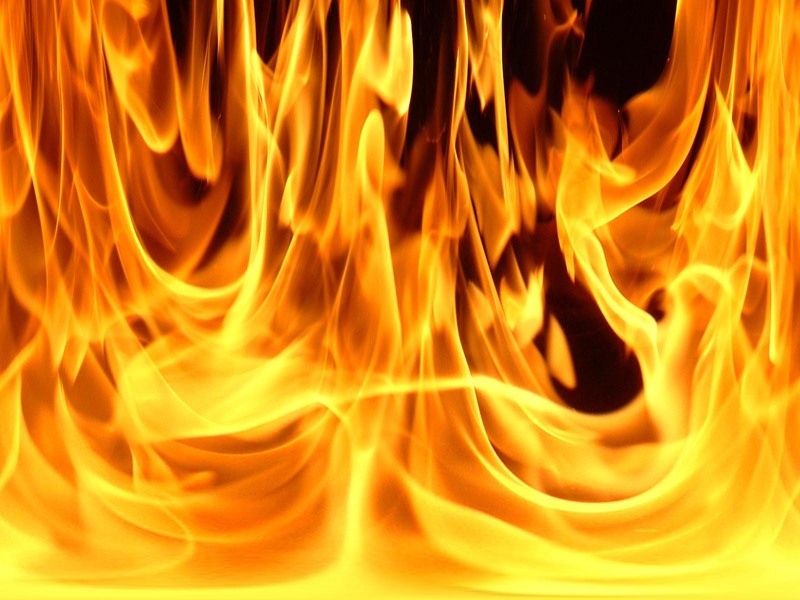 Her homes are kilns, firing up human beings, body and soul. I continue to ride my bike. 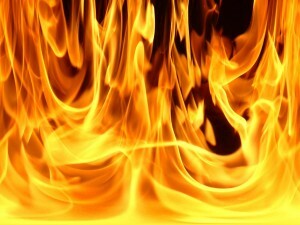 Until I realize that: Riding a motorcycle these days is almost like fording a river of fire. After all this, if there could be no rain and storm waiting for me at June! See. This heat admits no ray of hope. I fall asleep. Languidly. Tired. Am I still riding? There is an SUV beetling down through a 1339 km stretch of road that skirts glaciers and mountains capped with ice. On my right I can see through the window a scatter of icebergs receding along the lagoon until they meet a distant ice cap from where they break apart and drift down. Inside the vehicle, I shiver, my teeth chatter, my fingers numb with frost. We are trundling down along Route 1, the famous Ring Road in Iceland, that northern territory of human inhabitation. 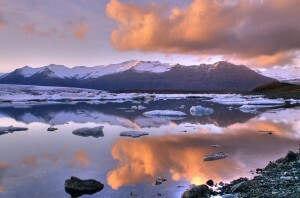 (Iceland – the country of snow and wilderness, the land of midnight sun and polar nights, the world of eternal twilight, the perfect terrain which keeps us in limbo between wakefulness and sleep). I drive. 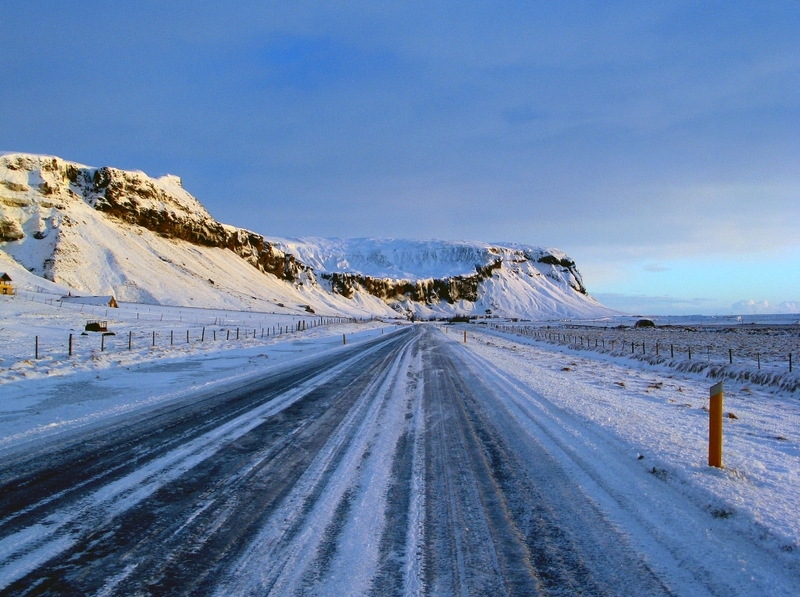 Obsessively along the national road of Iceland. Sheep stray out of their herd; horses gallop across the tarmac; they could hardly slow down my mad flight. I am a fugitive on the run, chased by haunting memories of tarred roads, blazing white-hot of a country near the equator, far, far away from Iceland. At the end, man sometimes seeks the one which he runs away from. This heat! I get away from it only to seek it again at the heart of snow. Or why else should I yearn to dive into the warm waters of Blue Lagoon in Iceland, near the ring road, famous for its hot springs? True. You wish for a crumb of summer when the temperature falls down to -30degree Celsius around you. Geysers (hot springs coming from earth) become sought-after homes, warm with vapour and care. 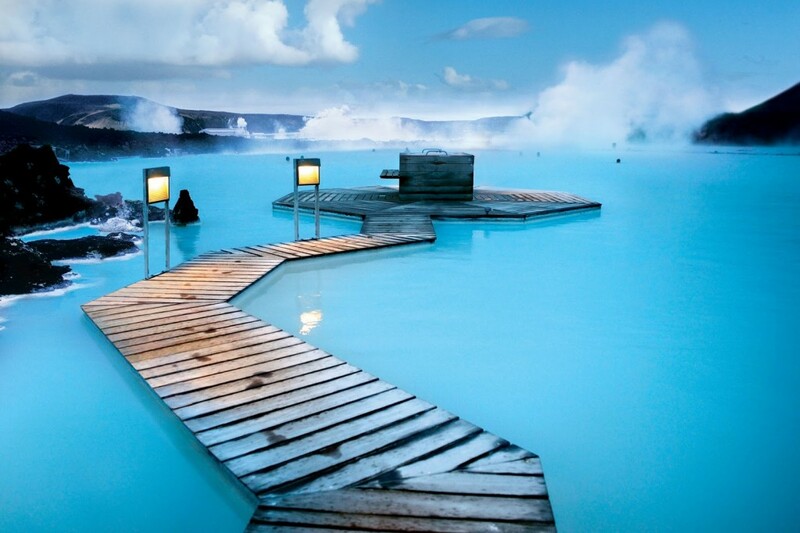 The phosphorescent saltwater of the (man-made) Blue Lagoon offers heavenly solutions for the extreme cold in Iceland. Slather on the mudbath, slip under the hands of a masseuse, warm the frigid thoughts in the heat of a sauna. See how the Blue Lagoon peps up the spirits and tosses me right back on Route no 1, as a newborn, zippy and daring, back in my itinerary. The moment one rubs Route No 1 the wrong way, the road turns up its spooky underbelly. The Blood Spring on the way is notorious for the human sacrifices made on its shore in the dark ages. Pagan temples, places haunted by fairies and beasts and Norse deities dot the road. The chilly, blue formations of ice you see in lagoons are perpetually shaped and re-shaped by buffets of merciless wind and water. Here’s Jokulsarlon, a pristine glacial lagoon on the southeast! This is one place light years away from all that we know in this planet. In the failing light (Most of the time it is failing light in Iceland), the icebergs you see in the water seem like bizarre animals culled out from the Jurassic era. Here I lie as a puny little pebble on the banks of the immense panorama. The mighty Vatnajokull, the largest ice cap outside the poles, from which these icebergs break and drift down, forms the colossal background. Vatnajokull holds weird surprises for the adventurer. Walk over the glacier until you reach the mouth of an ice cave at Svínafellsjökull, a frozen lagoon, breathtakingly beautiful in Skaftafell. Wait for me at its entrance. Now hold my hands as we sneak into a blue artery that winds down deep into the chilling heart of the cave. We stand under a large glacier; our imagination hits its dull head against the frigid roof, blue and jagged, vainly struggling to live up to what the senses bring in. Am I dead or alive! Listen to that voice! 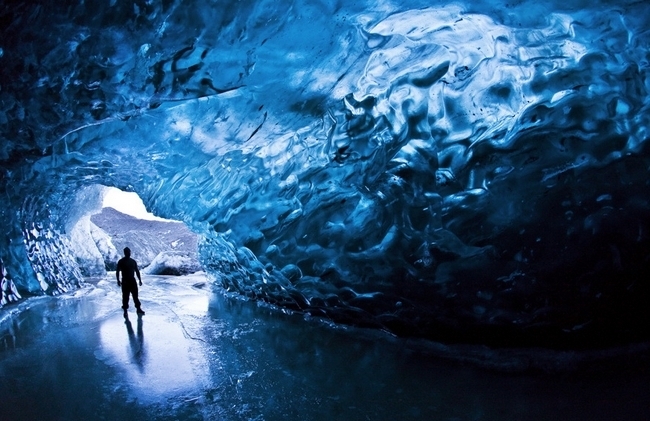 A loud rumble rebounds inside the cave whenever the glacier shifts a millimeter over our head. During summer, when the roof fails to hold it against the sun, ice caves might cave in and bury us deep in snow. So it’s time to make a hasty retreat to the SUV before the season gets moody. Tom -I’m so glad that you’re enjoying Iceland! After the U.S., Iceland is my faiorvte country in the whole wide world, and I encourage everyone to spend at least a day or so exploring if they ever have a stopover to or from Europe.I lived there as a tot in 1966 to a teenager in 1978 when my dad was in the Air Force and stationed at the big base you flew into. (The international airport is now separated from the base, but we were one big happy back then.) I’ve even casually enquired into Oracle DBA/dev jobs there, but I’m kinda spoiled now by being back in the states. But it’ll have a very WARM place in my heart!